We’re entering an odd stretch for the the seasonal craft beer drinker. Winter warmers are being phased out as we get further and further from Christmas, and flirtations with temperatures above freezing – even if for a day or two – leave us longing for something beyond a porter or a stout. Enter this mixed six pack of Michigan-brewed craft beer compliments of Ludington Beverage, a 4th generation 100 percent veteran-owned beer distributor. Based in Ludington, they’ve served West Michigan since 1933, so they know a thing or two. There’s a little something for everyone in this lineup, including hazy IPAs, an ale that mirrors a lunchbox staple and two beers that haven’t yet been released (Mountain Town Lazy River & Stormcloud Rainmaker). Enjoy! Mountain Town Lazy River: Brewed with green tea leaves and lime peels make for a distinct and fresh lager. The extra lagering time helps smooth out this easy drinking beer and gives it a clean finish. 5.2% ABV. Rochester Mills Juice Bigalow: A hazy IPA with juicy tropical fruit aromas and flavors with a subdued bitterness, achieved from a considerable amount of Citra and Mosaic hops added to this brew. The result is a standout among this popular style. Enjoy the Haze. 6% ABV, 69 IBU. ELK Brewing PB&J’ale’y: We know what you’re thinking, a peanut butter and jelly sandwich beer? And the answer is yes! This refreshing and sweet ale combines roasted peanuts and concord grapes to create a unique and enjoyable spin on everyone’s favorite sandwich. 5% ABV. Roak Hopgazer: Hopped with Ekuanot, Citra and Amarillo, this N.E. style IPA has a refreshing mouthfeel with aromas of orange, grapefruit and tropical fruits. It finishes with a heightened bitterness and a balanced sweetness. 6.5% ABV, 60 IBU. Perrin Light Lager: A crisp, clean, American style lager that’s very refreshing and light in color with no adjunct grains. This 3.8% ABV offering will surely make your day better. SPRINGFIELD, Mich. – Territorial Brewing Company, a brewery in Springfield that specializes in brewing lagers, announced today it has expanded brewing operations into a new production facility to meet increased demand by beer lovers, bars and restaurants in Battle Creek. The first batch of beer was brewed at the new location on Dec. 4, 2017. “We have struggled to brew enough beer and keep up with demand since first opening in November of 2014, and this new location will allow us to keep up with demand while staying true to the beers we love to make,” said Tim Davis, co-owner of Territorial Brewing Company. Up until December, Territorial was brewing beer in a space shared with its restaurant kitchen. Territorial produces mostly lager beers, which take considerably longer to ferment than ales. This limits the overall volume of beer Territorial can produce in a given time. The new production brewery is not open to the public. However, the original restaurant and taproom, located at 256 N Helmer Road, will remain open. “We’re proud to serve as a gathering place for so many customers who live and work nearby and thank them for their loyalty as we worked through our behind-the-scenes growing pains the last three years,” said Charles Grantier, co-owner of Territorial Brewing Company. “As Battle Creek’s only brewery, we want to help make Battle Creek and Springfield a fun, vibrant community and a destination for visitors near and far,” Davis said. ANN ARBOR, Mich. – As 2017 drew to a close, Rave Associates, the first distributor of Bell’s Brewery, reached a historic milestone with the Michigan craft beer institution: 1 million case equivalents sold in one year. A case equivalent is equal to one case of beer, or 24, 12 oz. cans or bottles. It’s the first time a beer distributor in Michigan, or any other state, has reached that achievement with Bell’s. Rave Associates brought Bell’s aboard in 1989, when the brewery was just 4 years old, and founder Larry Bell was delivering beer himself. “When we first started distributing Bell’s they were our smallest supplier, but now we have multiple trucks going in and out of our warehouse every day,” Warbritton said. Bell’s Brewery attached an array of balloons to the 1 millionth case headed to Rave Associates to mark the occasion. Photo courtesy Bell’s Brewery. WARREN, Mich. – Republic National Distributing Company (RNDC), the nation’s second largest premium wine and spirits distributor, is taking special steps this Veterans Day to honor the 637 associates who have served in our armed forces. Michigan is home to more than 670,000 veterans, according to 2015 data from the U.S. Census Bureau. There are more than 21 million veterans across the U.S.
RNDC is the second largest distributor of premium wine and spirits in the United States with operations across 22 states and the District of Columbia. RNDC operates out of four locations in Michigan: Warren, Brownstown, Byron Center and Escanaba. RNDC is the second largest distributor of premium wine and spirits in the United States with operations in Alabama, Arizona, Colorado, District of Columbia, Florida, Indiana, Kentucky, Louisiana, Maryland, Michigan, Mississippi, Nebraska, North Carolina, North Dakota, Ohio, Oklahoma, South Carolina, South Dakota, Texas, Virginia and West Virginia. RNDC employs more than 9500 individuals nationwide. For more information about the company, visit www.rndc-usa.com. ORION, MI – As Veterans Day approaches, Powers Distributing is taking special steps to honor 22 employees who have served in our armed forces. “We are proud to hire veterans and are committed to ensuring those who have served our country have access to a fulfilling and high-quality career when they return home,” said Thompson. Powers Distributing, a locally-owned, independent distributor located in Orion, services Oakland and Macomb counties. DETROIT – Great Lakes Wine & Spirits (GLWAS), Michigan’s largest distributor of beer, wine and spirits, today announced it is donating $100,000 to California wildfire relief funds. The distributor is donating $50,000 to both the Napa Valley Community Foundation Disaster Relief Fund and the Sonoma County Community Foundation Resilience Fund. California winemakers and distributors have worked hard to keep their business online amid the devastating fires. There were only temporary shutdowns of some distribution centers and warehouses during the wildfires, and GLWAS did not have any orders reduced, cancelled or retracted because of the fires. “The determination to maintain business as usual in the midst of this widespread disaster is a testament to the resilience of our California wine industry partners,” Cooper said. This is not the first charitable effort this year by GLWAS and its employees to help those impacted by a natural disaster. In September, the distributor donated a tractor-trailer to be filled with supplies to help the victims of Hurricane Harvey. GLWAS also recently donated $5,000 to Jack Daniels’ Operation Ride Home – which helps members of our military get home for the holidays – and sponsored an event that raised $58,000 for North Central Michigan College. “Beer and wine distributors and their employees have long been leaders in charitable giving at home and beyond, and we’re proud to reach out and help those in need, whether they’re in our own backyard or thousands of miles away,” Ross said. Great Lakes Wine & Spirits is a wine, spirits and beer distributor that services nearly 17,000 accounts in all 83 Michigan counties on both peninsulas. For more information, please visit www.GLWAS.com. PORT HURON, Mich. – As Veterans Day approaches, Earl Smith Distributing Co. is taking special steps to honor three employees who have served in our armed forces. “We are proud to hire veterans and are committed to ensuring those who have served our country have access to a fulfilling and high-quality career when they return home,” said Smith. Earl Smith Distributing Co., a family-owned, independent beer distributor located in Port Huron, services four counties in Michigan’s Thumb area. Ypsilanti, Mich. – O&W Inc., a family owned, independent beer distributor based in Ypsilanti, is setting an ambitious goal to raise $5,000 for breast cancer research through sales of Green Flash Brewing Company’s Treasure Chest, an IPA brewed with passion fruit. 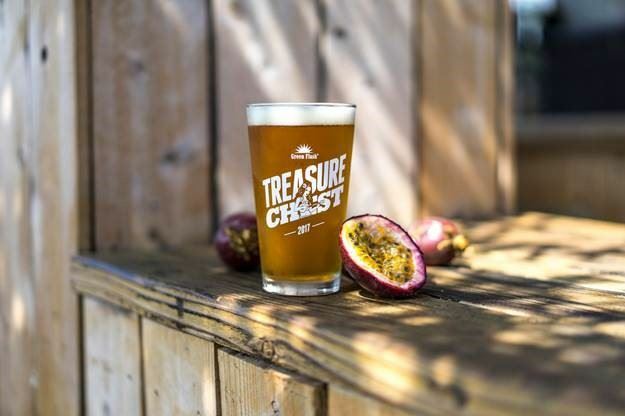 Throughout the month of October, for every pint of Treasure Chest sold during special events, O&W Inc. will donate $1, the retailer hosting the event will donate $1 and Green Flash will donate $1. Green Flash Co-Founder Lisa Hinkley, a breast cancer survivor, is passionate about giving back to those whose lives have been affected by this disease. Through the Treasure Chest program, now in its seventh year, the brewery has raised over $300,000. Green Flash first brewed Treasure Chest in 2011 and has rotated through different styles every year. This year’s iteration is a bright and tropical IPA featuring Green Bullet, Warrior, Citra, Cascade and Simcoe hops. The beer is finished with an infusion of passion fruit tea. You can find a full list of Treasure Chest events in southeast Michigan here. DETROIT – Great Lakes Wine & Spirits (GLWAS), Michigan’s largest distributor of beer, wine and spirits, is transporting supplies donated by Oakland County residents later this week to Texas to aid in Hurricane Harvey relief efforts. The distributor is donating a semitrailer for the journey to and from Texas. Oakland County residents have donated a wide-range of household items including cleaning supplies, diapers and pet food. Bertolini is coordinating the effort. His brother, a Houston resident, retired from the Houston Police Department earlier this year. “Most of us take the items we’re transporting to Texas for granted, but for many residents these are critical household items that are difficult to find,” said Syd Ross, Co-CEO of Great Lakes Wine and Spirits. CHICAGO – One-of-a-kind beers from Revolution Brewing, Chicago’s largest independent craft brewer, are available throughout the state beginning Monday, Aug. 21 through the M1 Network, a group of 10 MillerCoors distributors in Michigan. The founder of Revolution Brewing and many of the brewery’s employees have deep ties to Michigan, making their launch in the state a homecoming to many. “Josh celebrated his 21st birthday at Ashley’s in Ann Arbor while attending the University of Michigan, and some 20 years later he is returning to see his beer added to the renowned craft beer bar’s tap list,” said Wanty-Lambert. Ashley’s is hosting a Revolution Brewing launch party on Wednesday, Aug. 23. Revolution’s flagship IPA, Anti-Hero, and Mosaic Hero, which is part of the Hero Series line of specialty IPAs, will make up the initial rollout in Michigan. A special batch of Local Hero is also being brewed exclusively for the Michigan launch, made entirely with hops grown at Hop Head Farms in Hickory Corners, Michigan. Seasonal beers, beginning with Oktoberfest and later this year, the Deep Wood Series of barrel‐aged beers, will follow. With the addition of Michigan, Revolution is now available in eight states throughout the Midwest and East Coast. The M1 Network is made up of the following distributors: Alpena Beverage (Alpena), Alliance Beverage (Grand Rapids), Dan Henry Distributing (Lansing), Eastown Distributors (Highland Park), Great Lakes Wine and Spirits (Highland Park), Gerry’s Distributing (Port Huron), I.H.S. Distributing (Kalamazoo), John P. O’Sullivan Distributing (Flint), O&W Inc. (Ypsilanti) and Powers Distributing (Orion).